A secluded place of incredible natural beauty it may be, but the Peninsula is only just over an hour from the M5 coming from the north, just off the Atlantic Highway coming up from Cornwall and an hour from the A30. Use this page to download our brochure, find how to get here, link to maps, advice, weather, tide times, surf reports and further information. You can view our 2017/18 printed brochure and map with listings of all the places to go, stay and eat by clicking here. Hartland village is the centre for social and community life on the Peninsula and is where you'll find the shops, services, trades and markets serving this and the wider rural area. Click here for information about what's available within the village, including the post office and cash point, stores, church services, doctors and so on. Please visit the Hartland Forum for the community website for the parish of Hartland. 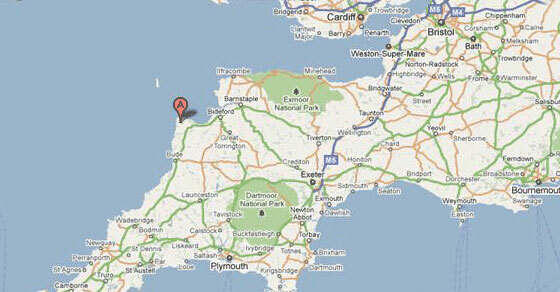 Click here to find the Hartland Peninsula on Googlemaps. From the North: Exit the southbound M5 at Junction 27 (Tiverton). Follow the A361 (Link Road) to Barnstaple, and stay on this road as it becomes the A39 Atlantic Highway for Bideford and Bude. Stay on this road until just past Clovelly then turn right at the B3248, which immediately takes you on to the Hartland Peninsula. From the Southwest: Take the A39 Atlantic Highway heading for Wadebridge/ Bude/ Bideford. Stay on this road and pass through Bude, then Kilkhampton and after a further 7 miles turn left onto the B3248 and onto the Hartland Peninsula. Public Transport: Many providers are willing to collect visitors arriving by public transport by arrangement - please ask at the time of booking. Nearest railway stations are Barnstaple (22 miles), and Exeter St Davids (44 miles). Connecting buses are from Barnstaple: Stagecoach 319 and from Exeter: Stagecoach Bus 6 for Bude change at Stratton for Stagecoach 219 for Hartland. If you are arriving by car, you may want to check your route for hazards or jams at the AA Roadwatch site or from www.trafficengland.com, or alternatively from the Highways Agency, or the RAC. The official website of the North Devon Area of Outstanding Natural beauty for planning walks, routes and finding about the history and culture of the wonderful coastline, including parts on the Hartland Peninsula. The official website for North Devon & Exmoor. The Peninsula is part of North Devon and just under an hour from Exmoor by car. The official site for Cornwall. The Peninsula is on the border with North Cornwall. The National Trust owns large tracts of the coast path and neighbouring land, including some ‘natural’ car parks around the Peninsula, and do extensive work to conserve some sites.